Samsung confirms 2018 4K and 8K QLED TV line-up | What Hi-Fi? 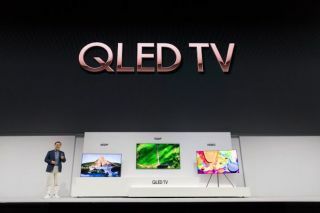 The Korean giant has announced 14 new QLED TVs for this year, including a no-holds-barred 85in 8K model. Following months of teasing its 2018 TVs both at CES 2018 and its own events, Samsung has finally confirmed the details of its forthcoming TV line-up. And the message is three-pointed. 1: QLED is here to stay (despite OLED rumours). 2: bigger is better (there’s considerable focus on larger screens; Samsung expects sales of 75in+ sizes to double this year). 3: 8K is part of the 2018 roadmap. While 2017 saw 12 QLED TVs across Samsung's Q9F, Q8C, Q7C and Q7F ranges (from 49 to 75in models), 2018 sees an even greater number of new QLED models. And this time they go all the way up to 88in. Heading up the 4K QLED range is the flagship Q9FN (pictured), which comes in 75in, 55in and 65in variants. Distinguishing it from the rest of the line-up is its use of Direct Full Array Elite backlighting, as opposed to the edge-lit methodology of the 2017 models. The Q9FN models have around double the number of dimming zones as the former flagship KS9500 TV. That's accompanied by Q Contrast Elite processing, which works to improve black level and detail, and minimize blooming (or bleeding, if you like) around the edges of bright objects in dark scenes. Indeed, the new 16bit processing engine, which powers the 10bit panels in the new TVs, has its work cut out. Samsung has also worked to improve the anti-glare and viewing angle, while reducing diagonal light leakage between pixels by a claimed 40%. All of the above support HDR10+ with dynamic tone mapping and, with the exception of the Q6FN, have at least 1500 nits of brightness and UHD Premium certification. But the big improvement is with colour volume, which Samsung says is directly linked to the luminance capability of the quantum dots. After claiming a 15% improvement in luminance from its 2016 to 2017 sets through the use of smaller dots, the leap for its 2018 sets is a further 5%. Samsung says this next step ensures its 2018 models are able to cover 100% of the DCI-P3 colour space. The elephant in the room: 8K. Yes, there is going to be a QLED TV with a 7680 × 4320 resolution. It’s going to be 85in, will be called Q9SN, and is due sometime in the second half of the year. Prices haven’t been confirmed, but a Samsung spokesperson tells us the Q9FN will be about £1000 cheaper than last year at launch, which would see the 65in version falling between the £3500-4000 mark. Recognizing the inexorable shift of TVs into the lifestyle and smart home market, Samsung has expanded its televisions’ smart functionality. ‘Universal Browse’ is a new search tool in its Launcher menu and works across usual suspects: Netflix, Amazon and BBC iPlayer etc. They will also be compatible with Samsung's Bixby voice assistant, but not at launch. According to Samsung, availability will be announced "in due course". A new ‘Ambient Mode’ is designed to give a TV a purpose even when it’s not being watched. Supposedly running at low power consumption (and with the ability to adapt to light conditions for power efficiency), it lets users fill the screen with, say, weather information, a landscape or a photo from a smartphone. This mode has been given a new button on the remote, which largely mirrors the design of last year’s handset but has raised keys. The new One Connect 2.0 box with the new models is a fair bit larger than the previous version, but that’s because it’s taken on an additional job: powering the screen. Like last year’s models, it connects to the TV via a ‘One Visible Connection’ cable, although this one’s slightly thicker (we’re talking just millimeters here) in order to take on that extra responsibility. 2018 sees the return of the ‘No Gap Wall Mount’ too, although small developments have been made to make installation quicker and easier. The TVs will also introduce Samsung’s new ‘smart' audio processing algorithm, which aims to enhance sound depending on content type by identifying the content’s metadata and continually analyzing and rendering the sound signal accordingly. For example, it will identify a silence in the signal and, knowing something is about to come, try to normalize dynamic range and enhance important details when it comes. The idea is the user won’t need to keep changing volume between content sources. “And what of the non-QLED lot”, you ask? Samsung has also today lifted the lid on its non-QLED 4K TV ranges. The ‘premium’ NU8500 and NU8000 models feature HDR10+ compatibility, as well as much of the smarts of the QLEDs, including Bixby voice control. Beneath those are two more 4K HDR ranges: the NU7100 (which spans 75in, 65in, 55in, 50in, 43in and 40in sizes) and NU7300, available in 55in and 65in. Remember The Wall? No, not the Floyd album, but the 146-inch monster of a modular TV Samsung showed off at CES 2018. Well, Samsung has said it will be available to buy (probably for many, many thousands of pounds) from August.